The Nikita(TM) "Bistro" 20pc Forged 18/8 Stainless Steel Flatware Set is the heaviest flatware set we sell. Each piece is drop-forged from a thick round bar of solid stainless steel. 20pc service for 4 with a flawless finish and dishwasher safe. Limited lifetime warranty. Gift box. The Sterlingcraft(R) Flatware and Hostess Set with Gold Trim will make an impression every day of the week or for those special holiday meal occasions when the entire extended family visits. 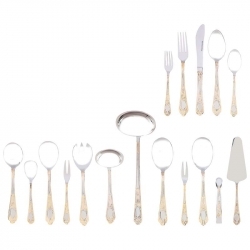 Elegant and extremely affordable, this Sterlingcraft(R) flatware set includes a complete service for 12, along with an expansive hostess set. 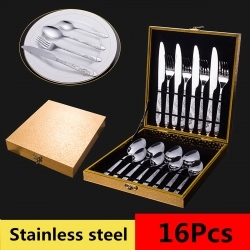 The Sterlingcraft(R) High-Quality, Stainless Steel 72pc Flatware and Hostess Set with Gold Trim includes 12 dinner knives, 12 dinner forks, 12 dinner spoons, 12 salad forks, 12 teaspoons, 2 meat forks, 2 serving spoons, 2 salad servers, soup ladle, gravy ladle, cake server, cream spoon, sugar spoon, and sugar tongs. Limited lifetime warranty. Gift boxed. 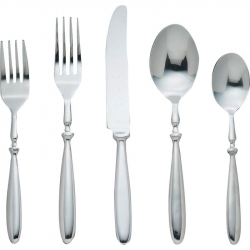 Beautifully polished, durable stainless steel, ergonomically designed flatware that is both functional and elegant.